“Helping Families Keep Memories Alive Forever"
Jerry Taylor Monuments offers a complete line of granite monuments, memorials, mausoleums and bronze markers to help you perpetuate the life of a loved one. 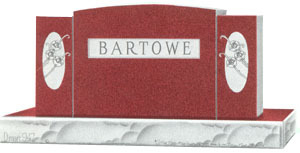 From custom design to installation, we will strive to make your memorial purchase simple and hassle free. Jerry Taylor Monuments can also assist you with any type of cemetery work, granite sign, granite cleaning or cemetery lettering project, We can even help you duplicate an existing family marker/monument. Monuments and markers provide a way to remember, honor, cherish, and tell the story of a life lived. There is not a finer tribute to a loved one than a lasting memorial. Engraved with your personal requests, our expert engraver and gifted artist combine talents and knowledge in providing the highest quality, yet affordable memorial. 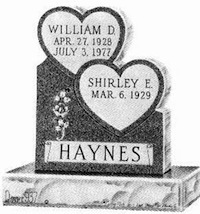 Fine granite memorials are an everlasting acknowledgement to family or friends. Beautiful bronze markers elegantly honor loved ones. At Jerry Taylor Monuments each memorial or marker is customized with a personal selection of granite, color, design, and size. We take pride in knowing that we provide the highest quality product and craftsmanship at affordable pricing. It would be our pleasure to provide a free design and cost estimate to you for a memorial monument or marker. Please contact us at in Louisville 478-625-7761 in Gibson 706-598-2301 or stop by 401 West 8th Street in Louisville or 57 College Place in Gibson and choose your family memorial from your locally family owned and operated Monument Company. Jerry Taylor Monuments - helping families keep memories alive forever. You’ve shared so much together. Happy times. Quiet times. The friendship the two of you have developed over the years simply won’t be forgotten after your animal companion passes away. You’ll want to commemorate that special bond, just as you would any other loved one with a high quality memorial. 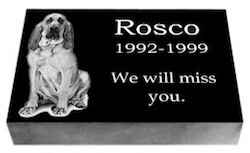 Our collection of pet memorials, crafted of the finest granite and bronze, allows you to select the appropriate marker for your beloved pet. Through today’s technology we can also offer you the option of a photo of you pet on the marker you select. A memorial is an enduring testimonial, purchased only once, to honor a life through the centuries.